By Ke-xin Zhao, et al. Gasteruptiidae Ashmead, 1900 (Hymenoptera: Evanioidea) is a worldwide distributed family, including two extant subfamilies Hyptiogastrinae and Gasteruptiinae and one extinct subfamily Kutujellitinae. There are approximately 500 extent species of this family are recorded in the world, with only 16 species in one genus are known from China. An extensive review of previously published literatures and previously unidentified specimens referred to Gasteruptiidae results in taxonomic revision of the family from China. This monograph includes identification of six new species and eight Chinese new record species, establishment of three new synonyms, and designation of three lectotypes. Descriptions and illustrations of the 28 valid Chinese species of the genus Gasteruption are provided and key to all Chinese species are made. 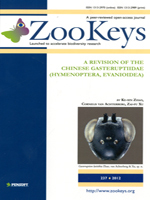 The results of this monograph clarify some taxonomic confusion, richen the geographical distributions of Gasteruptiidae in China and provide facilities for further research in Chinese Gasteruptiidae.